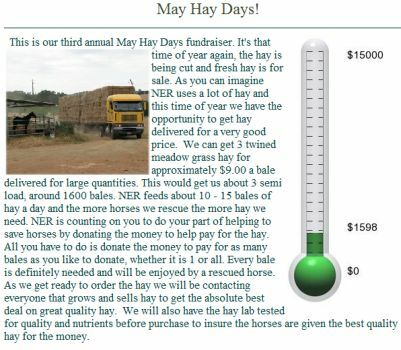 The only fundraiser currently going (other than the ever needed, never donated enough to general operating) is the May Hay Day fund. It is currently at $1,598 thanks to your generosity. 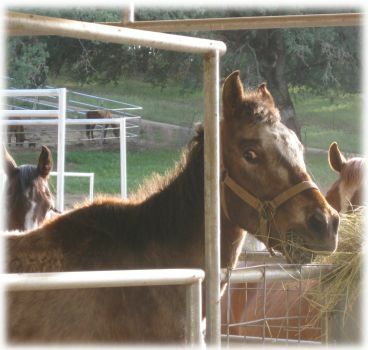 Thank you so much for providing funds to buy hay for the rescued horses. We have some great news! For the first time ever, we will be at the Western States Horse Expo. 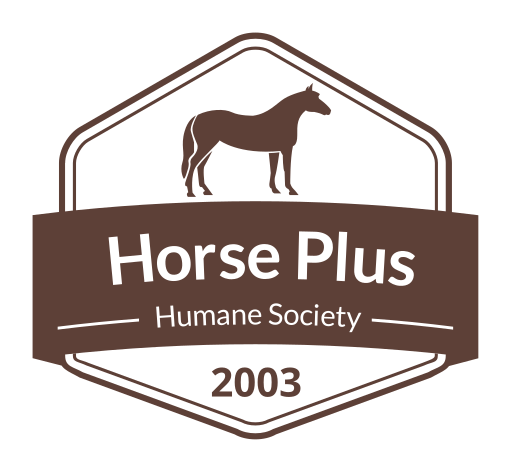 We are excited to announce that the Horse Expo is sponsoring our booth, booth 2002 in building B. Jaime has been working diligently on getting them to donate a booth, and she was successful today. The Expo runs from June 12-14 at the Cal Expo Fairgrounds in Sacramento. Jaime is heading up the Expo, Jason and Tawnee will be there on Friday, and maybe on Sunday. Thank you so much Horse Expo and Jaime for making it happen this year! Click here to learn about the Horse Expo. Just a reminder to put on your calender, June 24th is the Skating for Horses fun day at Cal Skate in Chico, CA. You won’t want to miss this fun event. There will be roller skating, miniature golf, Macho Man and Dotie will be there, just a whole lot of fun things to do. It is from 1-8 pm June 24th. Don’t miss it, fun for the whole family. Click here to visit the Cal Skate website. 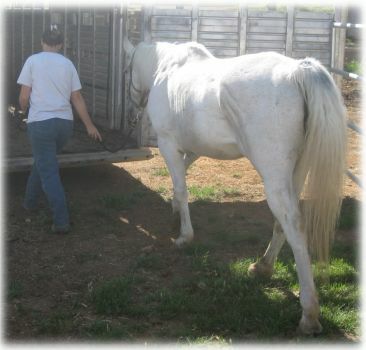 Today was the euthanasia clinic, here Tawnee is loading up the poor mare with Melanoma. It is so sad, but it is the only way to end her suffering. Cameron also went to the vet for his pre-adoption exam. 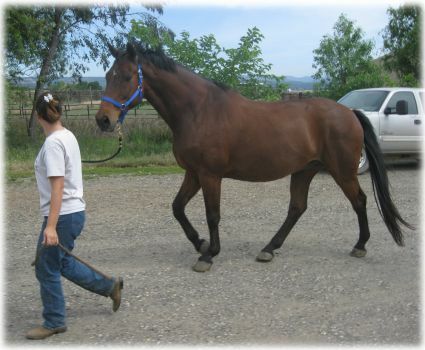 We always recommend that people get the horse they are interested in adopting an examination. This guy just might be heading off to Hawaii to join Mariah, the Grey Goose, living in the lap of luxury. For the first time ever, the Euthanasia Clinic was not overbooked, but only 1 horse came to the clinic from the public. We believe this is a positive sign! It is great that people are being able to care for their older horses now that winter is over, grass is growing and hay is getting cheaper. It is looking better for the horses out there. There will be a bunch of funds left over for the June euthanasia clinic. 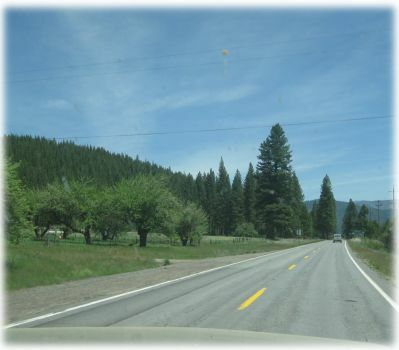 From the vet Jason and Tawnee headed to Taylorsville where NorCal was started. 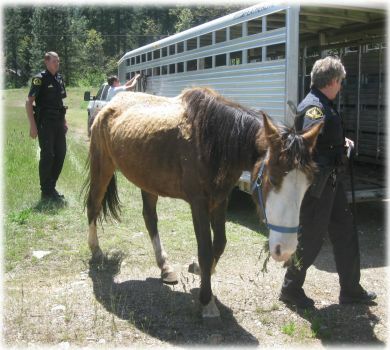 A guy was not caring for his 4 horses, and the county decided to seize them. On the way was the mandatory road construction that delayed the trip a bit. 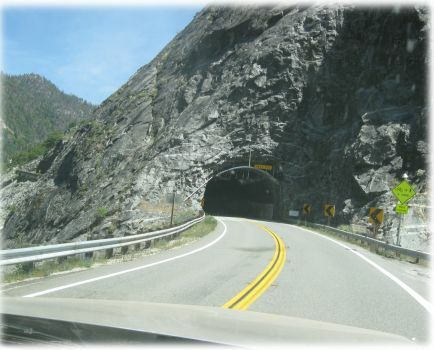 The tunnels of hwy 70 are always fun to drive through. 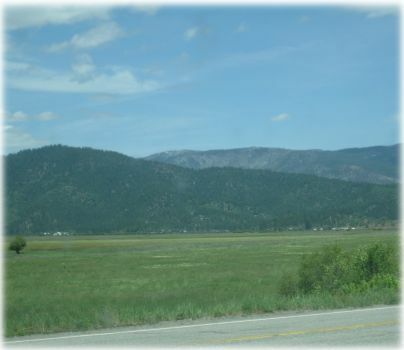 Finally after the long drive up the canyon, the beautiful green Indian valley stretched out before them. 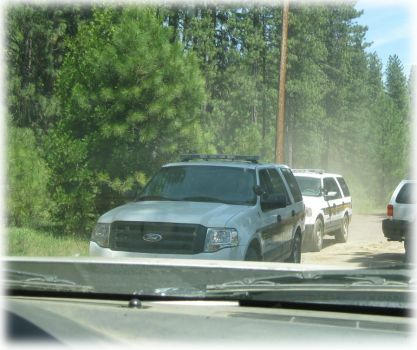 When we arrived, we had to arrive for the 2 sheriff deputies. 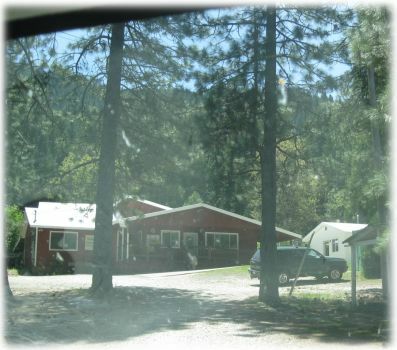 Come to find out, Tawnee knew the owner of the horses. He had wanted to adopt from us previously when we were in Taylorsville, but he did pass the adoption application and was denied. 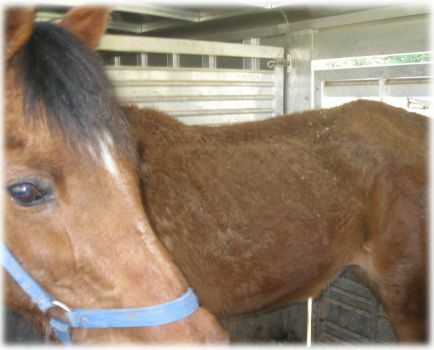 And a few years later we were at his house to seize his severely neglected horses. Once everyone was grouped together, they all headed out. They arrived at the man’s house and pulled into his driveway. The faces that greeted Jason and Tawnee seemed really sad. 1 horse had already died. Since Tawnee was in the Taylorsville area for so long, she believes she knows one of the horses. It is hard to tell since they are so emaciated, but the bay Arab mare she believes is a gymkhana horse, and she has seen her performing magnificently in many gymkhana’s, back then sleek and beautiful. 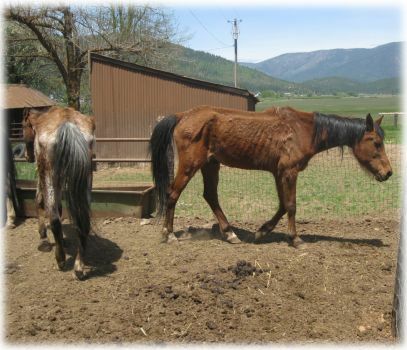 It was so sad to see these starved horses. The horses were just so sad and dejected looking, it was awful! 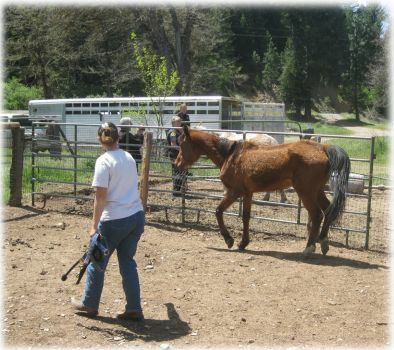 Jason and Tawnee, along with the county officials, got to work catching and haltering the horses. 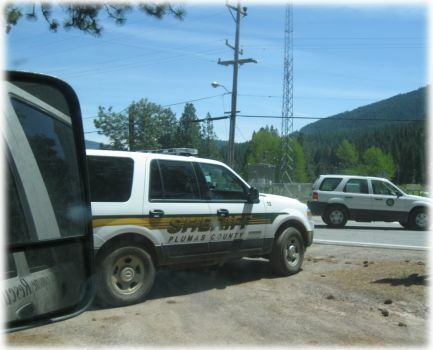 It was nice having the Sheriff officers there, just in case the owner caused trouble. Soon all the horses were caught and were being led out of their pen. And then they were loaded gently one by one. The terrible neglect is obvious. 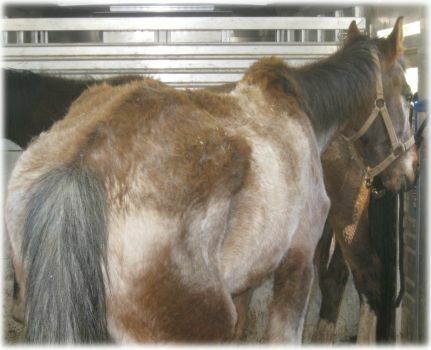 Once the 4 horses were loaded, it was off to the closest vet office to get them examined. It was a treat for Tawnee as it was the vet NorCal used to use when it first started. At the vet the horses were peering out, wondering what lay ahead. Glimmers of hope were plain to see in their eyes. Each of the horses were examined by the kind vet. Each one was given a body score of 1. They still have their winter, shaggy wormy coats so it is hard to see in the pictures how skinny they truly are. One by one the horses were examined. 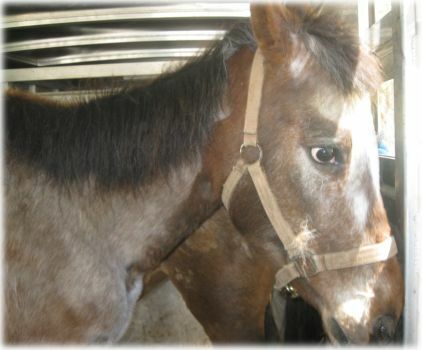 When Tawnee went in to get this horse out of the trailer, she couldn’t help but see the pain of abuse in its eyes. Her poor little body is so skinny. The horses were all dehydrated. At their home there was no water in sight. 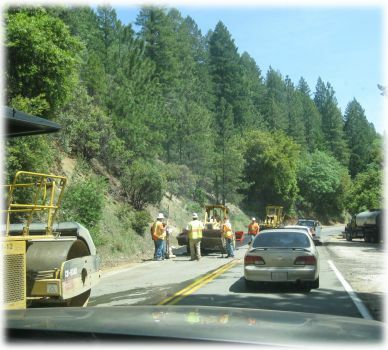 Every time the county worker was there, they had no water either. They were very grateful as the vet techs brought buckets of water out to them. The Arab mare enjoyed nibbling some grass while waiting for her examination. Soon it was her turn. She stood there like a good girl while she was examined. 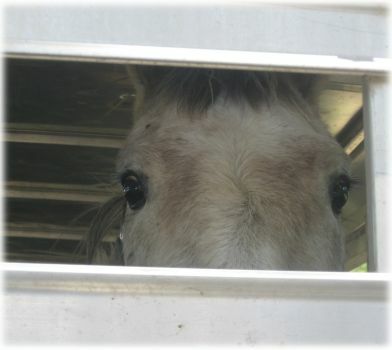 Finally all the horses were examined, loaded up, and ready to head off to the rescue. Each one is fine medically other than lack of care. The community has been very supportive of the rescue efforts. 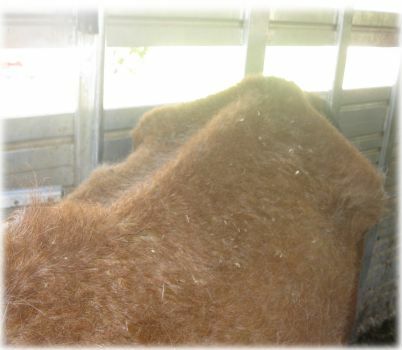 Hay has been donated to the rescue. 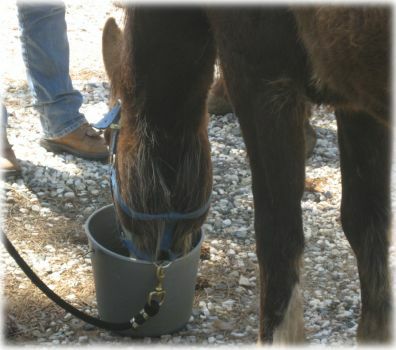 Locals have stated they are hoping to get some donations coming our way to help with the horses. We greatly appreciate this! We know there are a lot of people local to the situation that have been calling us. Thank you so much for your concern and efforts, you can rest assured that the horses are in a much better place and are receiving the care they so desperately need. 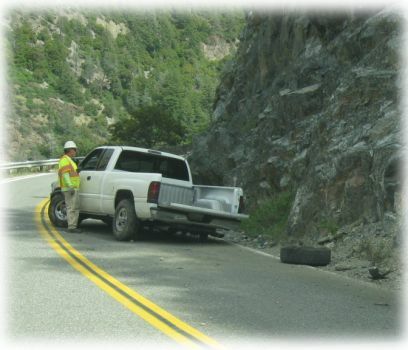 One the way back down the canyon, everything was going fine until they came upon this truck that had wrecked on the road. 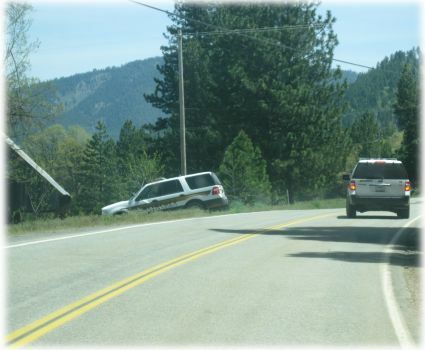 You can almost never drive up and down Hwy 70 without seeing a wreck alongside the road. It’s nice to see the wreck, the scary ones are the ones that go off the other side of the road, down the bank, and are never seen again… Several Highway Patrol, fire trucks, ambulance, etc went flying up the roads several miles down the road. We felt sorry for the poor horses ears as the sirens screamed by. 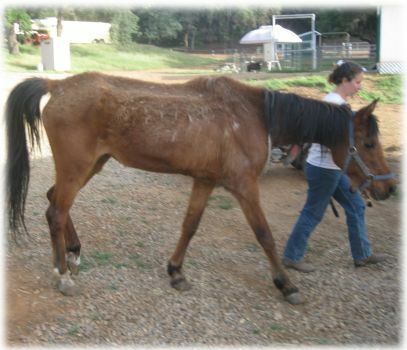 Back at the rescue, the poor skinny horses were unloaded without incident and put into the comfortable stalls. They’re definitely happy to get some good food and clean water after their big ordeal. 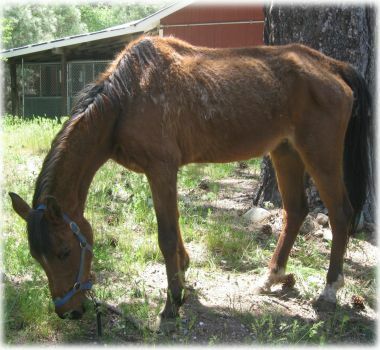 Any donations are greatly appreciate for our herd of emaciated horses. It seems to be growing by the day. Phoenix is doing somewhat better, and will be strong enough to travel next week, hopefully Monday. Thank you all for your support, it really makes a huge difference in the lives of so many horses. My heart just broke at the sight of that little roan… looks just like my pony, Misty. Best of luck and bless you for your amazing work!! 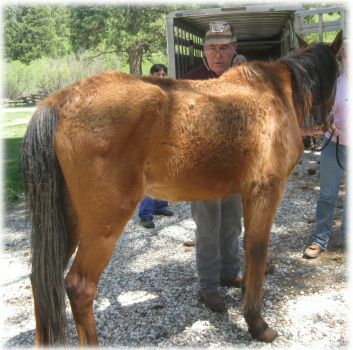 I knew the little bay Arab mare rescued from Taylorsville. The gal who rode her no longer lives at home and probably has no idea this has happened to her beloved mare. She rode in parades, playdays, and other events, and that mare always gave 110%. So sad this can happen to a horse that was so dearly cherished not long ago. Wish you’d been notified earlier, before things got so bad. Thank God for you, Tawnee and Jason, and the wonderful volunteers who do all you can to save these horses. 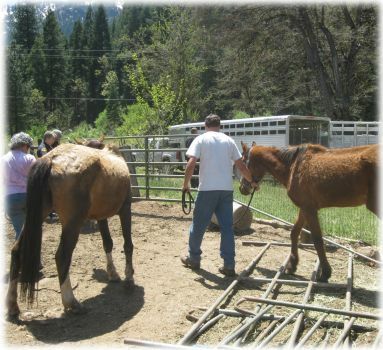 Tawnee and Jason… thank you for coming in to save these sad horses. The community of Taylorsville has been upset at the ongoing suffering of these horses and our individual inability to resolve it. 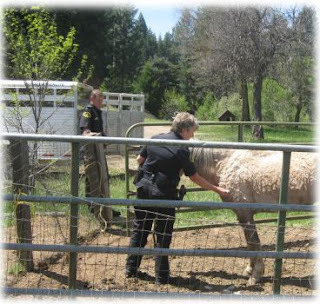 We are thankful of your relationship and cooperation with law enforcement to bring resolution and a brighter future for these horses. 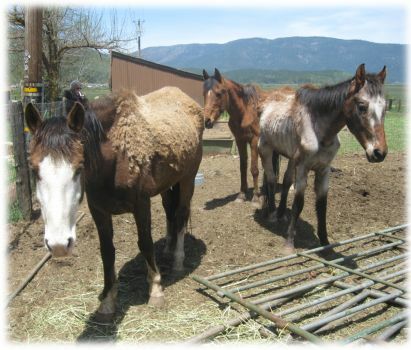 We will hope for a steady recovery for these sweet horses. I can not believe that the bay mare is the same horse that used to compete against us in local playdays….such a tragedy. Thank you again.